There seemed to be a sense of déjà vu at this year’s Music for a Summer Evening concert! However for once, the sun came out and it really felt as if the summer concert season was well underway. Apart from being a great social occasion with the chance of refreshments afterwards, it was encouraging to see a number of pupils (many of whom were Grade 6 standard and above), from Years 7 – 11 taking part. 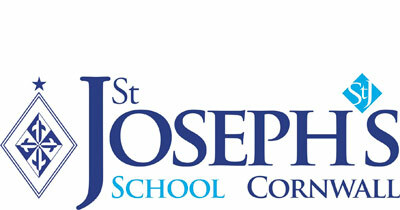 For such a young pupil base, their performances were outstanding. In addition to the many superb solo performances, the newly re-formed Wind Band gave their debut performance, playing I dreamed a dream from Les Miserables. 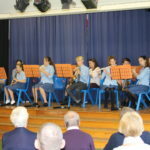 We welcomed a number of new players into the Band, including some pupils from the Junior School. The Boys’ Choir delighted the audience with their performance of Do you hear the people sing, also from Les Miserables. 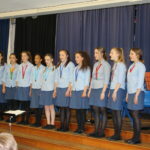 As has been the tradition over the past few years, when we have listened to some compositions from the Y11 GCSE Music group, this year was no exception. Hattie and Holly proudly presented their Set Brief from the Exam Board to the audience, both of which were very well received. Members of Canzonetta have also been working very hard throughout the past term and performed A Bunch of Thyme arranged by Michael Neaum, Philip Lane’s Full Fathom Five and Frank Bridge’s arrangement of the tongue twister, Peter Piper, to a very appreciative audience. The evening ended with Canzonetta and the Boys’ Choir joining forces and performing Rutter’s Gaelic Blessing, followed by Rhythm of Life from Sweet Charity. They were joined by former Head Choristers Alina Nuta (2015-2016), and Rosanna Rowe (2016-2017) for both pieces. 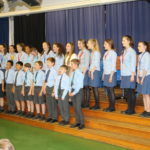 A huge ‘well done’ to everyone who took part – especially all the soloists who performed so brilliantly: Katie Heard (Musical Theatre), Fallon Gillies (Violin), Issy Thorns (Flute), Darcey Courtney-Bridgey (Piano), Lucas Drayton (Singing), Alec Macdonald (Trumpet), Lucy Rowe (Singing), Holly Whale (Trombone) and Hattie Loe (Singing) as well as members of the Boys’ Choir, Canzonetta, the String Ensemble and the Wind Band. It was a fantastic evening and £182.50 was raised for the Cornwall Air Ambulance.